The hand is often the first point of impact in injuries. For this, hand fractures are common. Injury can happen after a fall, a punch, a twist, or a sudden pull. Most injuries, when serious, are obvious. The most common are fractures of the hand bones (metacarpals) or the fingers (phalanges). Sometimes, a tendon or a ligament is pulled of the bone, and it may or may not pull a piece of that bone with it. X-rays show most of those injuries, but sometimes, especially with the injury involves a tendon or a ligament, it may not show. Such injuries can be missed and under estimated. The hand has 5 metacarpals. The most common injury is a punch, and as such, they are called ‘Boxer’s” fractures. Boxers, however do not frequently get those fractures because they practice good technique and wear protective gloves. These fractures should be more properly called ‘fighter’s’ fractures. Mallet finger is an injury to the far most of the finger knuckles. It usually happens with impact to the tip of the finger, such as when a ball (often a basketball) hits the tip as the hand reaches for it. The patient will notice an immediate droop of the tip of the finger. The finger will not be able to straighten on its own. X-rays help show whether the injury is isolated to the tendon or whether the bone has been broken as well. Ligaments are soft structures that keep two adjacent bones together. When ruptured, the two bones become un-linked, and the joint may pop out-of-place. This may happen with a sudden forceful injury, which results in a dislocation, or may repetitive, and results in instability. Following an acute injury, any of the knuckles may be dislocated. When it happens, it is imperative to push it back in place, usually after numbing the injured digit. It pushing it is not possible, surgery may rarely be necessary, as soft tissues may be trapped preventing the reduction. 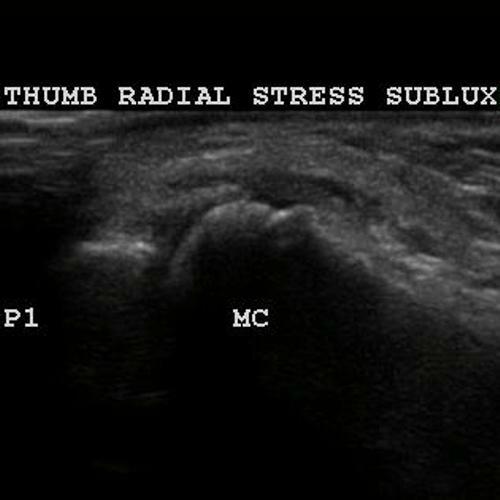 The most susceptible area for repetitive injury is the thumb. Historically, it is called ‘Game Keeper’s thumb’. In modern days, it is common in Skiers. 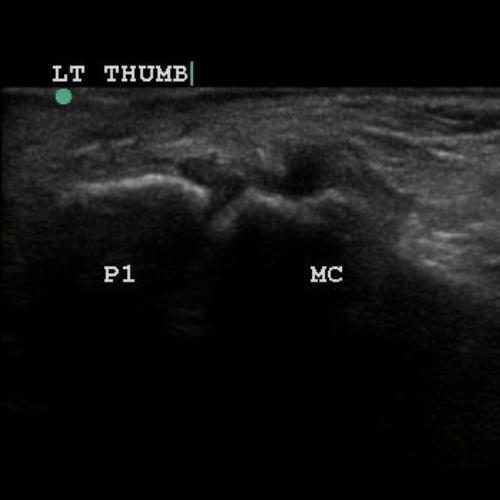 The thumb does not pop out of place, but it does partially slide with grip and when pulled on as seen in these ultrasound images.